Projects are funded through the Dam, Lake, Stream, Flood Control, Water Resources, and Wastewater Treatment Project Bond Act of 2003 and the Shore Protection Fund and are individually managed through the Office's Bureau of Coastal Engineering and Bureau of Dam Safety & Flood Control. 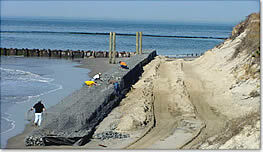 Engineering and Construction is now coordinating or managing more than $1.5 billion in federal post-Sandy projects, including the USACE with coastal construction projects that will complete our strategy for a comprehensive shore protection system. Additionally, the Office of Flood Hazard Risk Reduction Measures is responsible for two Rebuild by Design projects on the Hudson River and in the Meadowlands with $380 million of new funding.